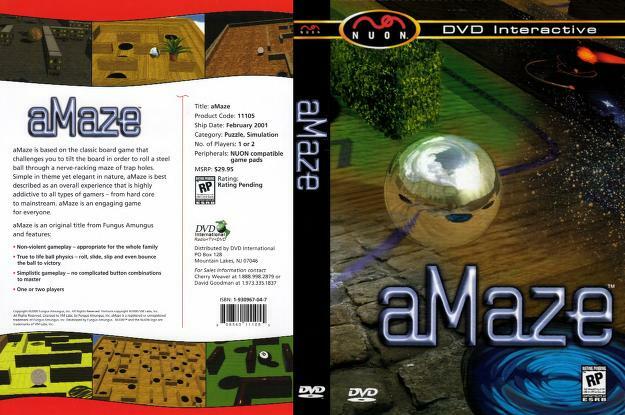 aMaze was a planned exclusive game for the Nuon and was based on the board game of the same name. Announced in 1998 when the Nuon was announced and distributed by DVD International, aMaze was complete and set for a February of 2001 release date and would have sold for $29.95. The game was abruptly canceled between 2000-2001 for unknown reasons, though it is likely due to poor sales of the Nuon. To this day no builds or copies of the game have since surfaced. The mid to late 1990's saw consoles switch from cartridges to CD discs. VM labs wanted to make a system that could play both DVDs and video games. With that in mind, the Nuon was unveiled at E3 1998 under the name Project X.
VM labs at E3 1998 unveiling Project X. It would not be until October 27, 1998, that VM Labs formally announced at Nuon with a 1999 release date. Though it was not until 2000 that the Nuon was formally released, but due to multiple issues the system suffered from poor sales and was discontinued in 2003. In aMaze 1-2 players would control a steel ball through a level that was riddled with trap holes. In order to move the ball, players would have to tilt the board. The player would get the ball through a hole which would mark the end of the level. Despite the fact aMaze was ready to ship to stores, it was never released. As of the writing of this video gameplay footage, screenshots, and official box art of the game have surfaced, but no builds for the game nor has the game itself surfaced in its entirety. Gameplay footage for aMaze has been uploaded to YouTube, but it is unknown if the gameplay footage came from a developer who worked on the game or a collector who owns a copy or build of the game. Thirty three seconds of gameplay for aMaze.